Hats off to you, Michael Grant, for writing what I hope will become a must-read trilogy for anyone. I’ve just finished this surrounded by articles in today’s press about the furore over whether or not to wear a poppy in remembrance of those who fought in war. From this remoteness, even though we can read of atrocities committed throughout the world at the touch of a button, it’s all too easy to forget about the sacrifices of those who went to war. We should never forget. In this final instalment of the trilogy we follow our favourites Rainy, Rio and Frangie through the last push. We focus on battles that might sound familiar, but the details we’re given here vividly bring the events to life. At times this was hard to read. Senseless brutality, questionable moral decisions being taken and a no-holds barred account of what happened. Some of it may have been imagined, and some of it may have been far worse. But it’s important not to ignore…how else will you encourage people to stand up for what is right? Thank you NetGalley for granting me access to this prior to publication (scheduled for January 2018). It was a privilege to read…and I’ve pre-ordered my physical copy. It is the summer of 1943 and our women soldiers, with the cries of battle fresh in their ears, are being shipped out – with the rest of the American army – to conquer the Italian island of Sicily. With some time having passed since I read the first in the series, it did take a little time to get back in the heads of Frangie, Rainy and Rio though they remain fascinating characters. 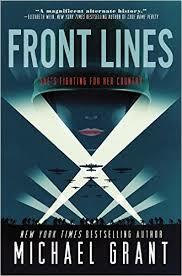 Once again Grant blends the historical detail with masterful storytelling to create the kind of book that you want to devour in one sitting, but also savour for what it tells us about war and our attitudes to fighting. As Grant points out, he tones down the reality faced by those at war and that’s a sobering thought. The accounts of battle are vivid, and it is as if we are alongside the soldiers through their experiences. Too often, there were details I’d rather not have to think about, but I think that simply shows why books such as this are needed. I felt mixed emotions while reading this. I felt frustration at the situations these men and women were placed in; I felt annoyed by the casual sexism and racism that was faced; I was dismayed at the seeming ineptness of some of those in charge, but my overwhelming feeling was of intense admiration for those who can face their worst fears as these characters do. I received a copy from edelweiss in exchange for my honest thoughts, and I have to thank them – and Grant himself – for giving me the opportunity to read this. 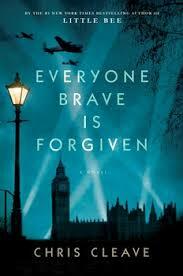 When war is declared in 1939 Mary North, the daughter of a wealthy family, signs up to do her bit. She is assigned the role of teacher, which those who supervise her think she is wholly unsuited for and she is ordered to remain in London. Determined to do her bit, this fiery character seeks an audience with the education administrator and practically demands that he let her resume teaching those children not deemed suitable to be evacuated to the countryside. Tom agrees, and so marks the beginning of an unusual relationship. Mary is passionate and her relationship with Tom becomes personal. This might have become a pedestrian romance in the hands of less engaging writers, but Cleave introduces a third character, Alistair, and thus begins a wholly engaging story. The characters of Mary and Alistair are loosely based on Cleaves’s own grandparents, and the personal investment in this shone through in the tender portrayal of the relationship. Cleave is unflinching in his depiction of the wartime experience, and I felt the writing was evocative. Though a happy ending seemed inevitable from the outset, I think that one of the strengths of this novel is the cast of characters surrounding our main trio. Throughout I was keen to know more about their experiences and how the war affected them. 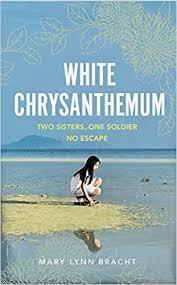 Published in early 2015, I am kicking myself that it has taken me so long to feel in the place to read this debut novel. 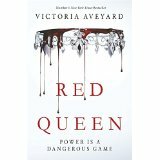 ‘Red Queen’ is the story of seventeen-year-old Mare Barrow, a Red who is regarded as lesser than the ruling Silver elite simply because of the colour of her blood. Mare is a petty thief who, through some pretty powerful intervention, finds herself living in the Royal Palace. As a threat to the established order – because she has a talent like nothing that has been seen before – Mare is given a whole new persona and so begins a very dangerous game. From the opening pages of this book I was gripped. 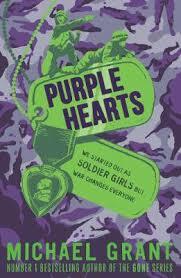 Throughout the book we are introduced to numerous characters and situations that were quite compelling. Mare’s relationship with Prince Cal was an obvious device on which key plot elements hinge…but as you’re reading it, it doesn’t matter. As the characters get caught up in the machinations of the Silvers and the desire of the rebellious Red Guard to overthrow the status quo, it’s hard not to get caught in the intensity of this novel. Mare, along with a number of characters, is but a pawn in a much bigger game and this novel perfectly illustrates the adage of keeping your friends close and your enemies closer. While I was desperate to finish this book, I was also quite upset at the realisation that there will never again be a first meeting with a new favourite. While this is not a complex book, it deals confidently with complex issues. The opening clearly establishes the relationship between Pierrot and his deaf Jewish friend – a relationship that will become highly significant later in the novel. When young Pierrot’s parents both die he is sent to an orphanage and we start to get a sense of what was happening in the background of the time. Slowly, we are immersed in a world where the rights of a group of people were eroded piece by piece. As with ‘The Boy in the Striped Pyjamas’, seeing this world through the eyes of a child makes it more horrific. Initially I found the character of Pierrot more likeable than Bruno; this is why what happens subsequently is more chilling. The discovery that Pierrot has an aunt who is willing to look after him seems a good thing. Following him on his journey we witness snapshots of the changing attitudes in Germany. These do not make for comfortable reading, though I wonder whether the significance of the events will be apparent to younger readers. When Pierrot arrives at the home where his aunt is housekeeper we think he will be safe. Sadly, the master of the house is Adolf Hitler and what we have to witness is the gradual erosion of the moral compass of this young boy. Pieter (as he becomes known) comes to worship Herr Hitler and we watch helplessly as he is drawn into a world so different to the one his family envisaged for him. His betrayal of his aunt was a truly horrific scene to read, and the actions of Hitler leave us in no doubt that what we are witnessing is the destruction of innocence in one man’s pursuit of glory. Pieter becomes a character that is so twisted by the values/beliefs of those around him that he is quite repellent at stages. Ultimately, he is still a child at the close of the novel and Boyne is careful to make clear that while Pieter has committed some unspeakable acts he is very much a product of his environment, and not beyond salvation. Reading about such a subject is not, and nor can it be, pleasant, but I feel this is a book that deserves to be read.